The child theme uses its own customizer settings. 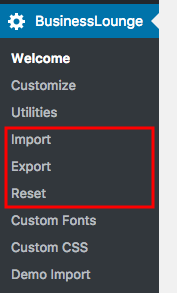 If you already worked in the customizer of the parent theme and you want to carry over the settings you need to export the customizer settings ( BusinessLounge ▸ Export ) first while the parent theme is still active and import (BusinessLounge ▸ Import ) them back into customizer after activating the child theme. Either way, the customizer needs a reset, import or save of settings. Otherwise, the pages in the front of your website will not look ok. This comes with the way WordPress stores the customizer settings per activated theme. If you don’t want to import the settings in the customizer then you may need to reset the settings after activation of the child theme.